Seamless Smooth Segment Rings - Also now available are a range of easy to fit Hinged Segment Rings made from wither steel or Titanium. These seamless segment rings are similar to ball closure rings but with a part of the bar cut and used in place of a dimple ball. 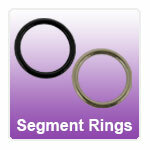 Segment rings should give the appearance of a complete ring with no break. Because they are so smooth you are able to rotate them around your piercing without the worry of getting caught and making it sore. "Great selection and really quick delivery! Fast and easy to order and the products are better than I expected! Love my new belly bar and earring...."
"Amazingly quick delivery, high standard jewellery! Been using jobananas for years and highly recommend!!" "I've ordered 3 times over the last 6 months here for my helix piercing and I've never had a problem with any of the products!! The materials are..."